Hung over and feeling more than a bit sorry for myself after a night on the sauce I'd tried the all old tricks to shift that slightly leaden feeling behind the eyes. An English breakfast, cups of tea, and a handful of painkillers hadn’t really done the job. So, I was trudging around town doing a few chores and picking up a few bits for dinner. I figure that after the greasy breakfast and with my head still pounding I’m going to need something fresh tasting, something with a bit of zing to cut through the fog. I’m in my local deli and I pick up a jar of wild asparagus in virgin olive oil whilst the lady behind the counter is cutting wafer thin slices of Prosciutto Toscana for me. 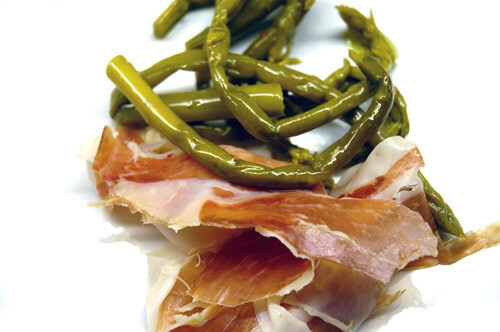 These are thin crunchy and with a fierce intense flavour and with proscuitto and just the thing to clear the head. They are preserved raw and the oil is a brilliant green colour, which dribbled over Parmesan, gives a double punch of flavour. Dinner consisted of a plate of the cured ham, a pile of the asparagus and a plate of spinach with butter beans spiked with garlic. Strong flavours, but clean ones to cut through befuddlement and self pity. my mum sends me boxes of Resolve. Even though they only let her buy one box at a time in Sainsbury's. i wonder if they taste anything like the jamon pata negra here in bcn. hi there. nice pixs. I'm a food blogger from Singapore. I added your site as a link on mine. I hope you dun mind! keep up the great work! cheers! I just recovered from a nasty cold including lots of headache - so you have all my sympathy :) I hope, the aspargus/prosciutto combo (extravagant photography!) helped you over it!